This is a comprehensive article about all aspects of kindergarten math, with recommendations for workbooks, and lists of free worksheet resources. Worksheets for shapes, matching, equivalence, etc. Expose the student to two-digit numbers. Children may also get started with money, time, and measuring, though it is not absolutely necessary to master any of that. The teacher should keep it playful, supply measuring cups, scales, clocks, and coins to have around, and answer questions. During 1st grade, children will then learn addition and subtraction facts, two-digit numbers, some adding and subtracting with two-digit numbers, and some basics of measuring, time and money. Have a deck of regular playing cards minus the picture cards. Each person draws a card. The one with a higher number wins all the cards played in that round. This can teach both number recognition and counting, because the child can count those little pictures (hearts, spades, clubs, or diamonds) on the card. A variation of the one above: deal two cards to each person. The person with a higher TOTAL wins all the cards played in that round. Children will learn basic addition! Use any board game. Have the markers advance as many steps as a die or dice show. The child will need to count the dots on the die or dice, and then count steps to move his marker. Lay a bunch of dominoes face down on the table. A child picks one, you pick one. The person with a higher "dot-count" gets both dominoes. Lay a bunch of dominoes face UP on the table. A child picks one and places it on the table to start the "train". The next person picks one so that its end matches one end of a domino already laid. Play with marbles or blocks or similar objects. You take some objects, and ask the child to take for himself as many as you have AND ONE more. Then it's the child's turn to take some, and you need to take the same amount plus one more. Reverse the game later to do ONE LESS. From counting you can go on to simple addition and subtraction with small numbers. The idea is to teach the child the CONCEPTS of addition and subtraction, and not to worry about memorizing addition and subtraction facts (those come in 1st and 2nd grades). You can for example use this simple bus activity where people come in (or go out of) the bus on different bus stops to illustrate the meanings of addition and subtraction. One extremely helpful manipulative to buy is a basic 100-bead abacus (10 racks, 10 beads in each). This is the prime "toy" to teach numbers beyond ten. 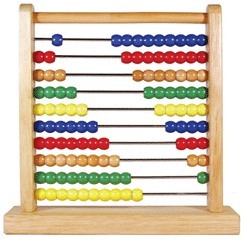 With such an abacus children will naturally learn their "tens and ones". I've written about the usage of abacus for learning place value here. The best kind of abacus has each five beads in alternating colors, like the abacus from Schylling you see on the right. 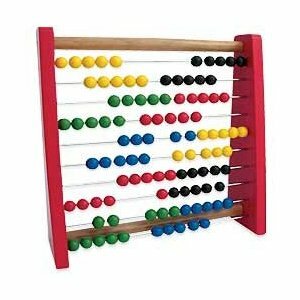 If you can't get one with 5 and 5 beads in different colors, then get a regular abacus with 10 beads in each row, such as Melissa & Doug classic wooden abacus . You can browse Amazon's abacus selection here . It is helpful to have concrete numbers (plastic or foam) that the children can touch. Other than that, games are again an excellent way to reinforce learning. Here's a simple game: Have a bunch of foam numbers and/or plastic magnetic numbers , and make a heap of them between you and the child. You pick one, hold it up high and call out loud its name, such as "Number five!" and put it to your personal pile. Play all kids' favorite card game: UNO . That'll motivate children to learn to recognize numbers quickly. Check my list of online addition and subtraction games. To recognize shapes and practice matching, you can either use ready-made worksheets or workbooks, or make some of your own. If you make your own, you can just draw three circles on a page and then 2-5 triangles on a page, and ask the child to match each circle with a triangle by drawing a line from shape to shape. Vary the shapes and the amounts. Sometimes the amounts should be equal, sometimes not. Another variation is to ask the child to draw. First make some sticks, circles, squares, or other shapes on a page, and encircle them. Make for the child a big "bubble" to draw in, and ask the child to draw either the same amount, one more, or one less. Also have your child practice writing numbers on paper. 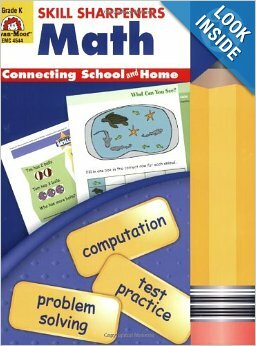 I like to recommend Math Made Easy: Kindergarten Workbook by Dorling Kindersley as it's of good quality and simple to use. The whole series of Math Made Easy workbooks is quite good. Evan-Moore always publishes quality materials and their kindergarten workbook is no exception. Yet another kindergarten math workbook to consider is Singapore Math — their EarlyBird Kindergarten Mathematics is praised a lot. You can find lots more kindergarten math workbooks at Amazon. You don't need anything too fancy to practice these concepts, so workbooks from many different publishers can work equally well. PRINT Handwriting Practice Worksheet program — you can use these to help children practice writing of numbers. Use puzzles and activities to help develop the child's logical reasoning. Check out for example these mazes, Find-the-Twin puzzles and easy animal dot-to-dots made by my daughters! If you don't want to get a complete curriculum but prefer shorter books, then check out Addition 1 in Math Mammoth Blue Series as it is the first and easiest book of that series, suiting the beginning of 1st grade. Both the 1st grade complete curriculum and the Addition 1 book start out dealing with addition within the range 0-10, but they also include missing addend problems such as 3 + __ = 7 and word problems. Kindergartners or younger children MAY get confused with the missing addend concept. If that happens, don't worry – just wait and let the child's brain mature.